A small, quiet community in Maricopa County, Carefree, Arizona is a beautiful desert city. With a population of around 3,000, you will find the city peaceful and quaint, and the houses beautiful. A leisurely town, you will find comfort in your surroundings. It has a population 3,363 residents and rests on 8.9 square miles of land. Carefree is a beautiful town full of spectacular views of the Sonoran landscape. The residential community is incorporated well with the flora and fauna of the lush Sonoran Desert. Right within the heart of the town is where you will find a walkable business district that has many dining and shopping areas for your pleasure. There are many beautiful homes in the quaint town of Carefree. The most popular and widely found types of homes are single family homes, but there are other options for those who need something different for their residential needs. The median home value is $690,500. The home value rate has risen by 3.6% in the past year and it’s predicted to rise by another 2.8% in the coming year. 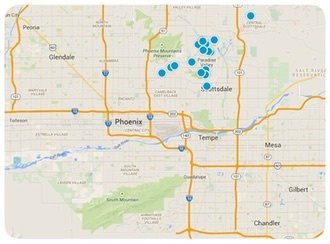 The median price per square foot is $245 and this is higher than Phoenix Metro’s median of $124. A Carefree home is the way to go if you and your family desire a relaxed, close community, and the Russell Shaw Group will do everything possible to help you find properties that are right for your lifestyle. As top REALTORS® in Carefree, we make it our business to be aware of every Carefree home for sale. If Carefree, Arizona real estate is what you're interested in, we will find your ideal home. Search through our website to find all the listed properties, or talk directly to one of our helpful agents. Either way, we are sure you will be satisfied with our expertise and service!